until I return to California to be with my family there. I'm in wrap-up mode here, building a pile of things that will go back with me and finishing projects so that I have somewhat of a clean slate when I return to NM again in May. It has been nice, having these weeks to be with my family here. I spent the first 5 weeks spinning a lot (more on that later), knitted and shipped off a box of sweaters, socks and hats for donation to school children in Afghanistan, and purged the pantry shelves of ancient food stuffs, including two bags of special flour I brought home from Ireland in 2001, thinking I would learn to make their wonderful brown bread (really? Did I think going to Ireland would make me suddenly want to learn to bake??). It feels really good to have these things done; so much went to hell in a hand basket, as my mom would have said, during those years I was working full time. And, as usually happens, I was once again reminded that the doing was not nearly as painful or time consuming as the years I spent dreading the tasks. Why do we do this to ourselves??? Not the best photo, but you get the idea! has been gracious enough to sell my hand spun yarns these last months (she hosts a showcase there for visiting fiber artists). It has been a big gift for me that she's willing to take her time to do this, because I haven't yet come to peace with whether I want to figure out how to manage my own Etsy shop while living in two states or just close it down (it's "on vacation" for now). 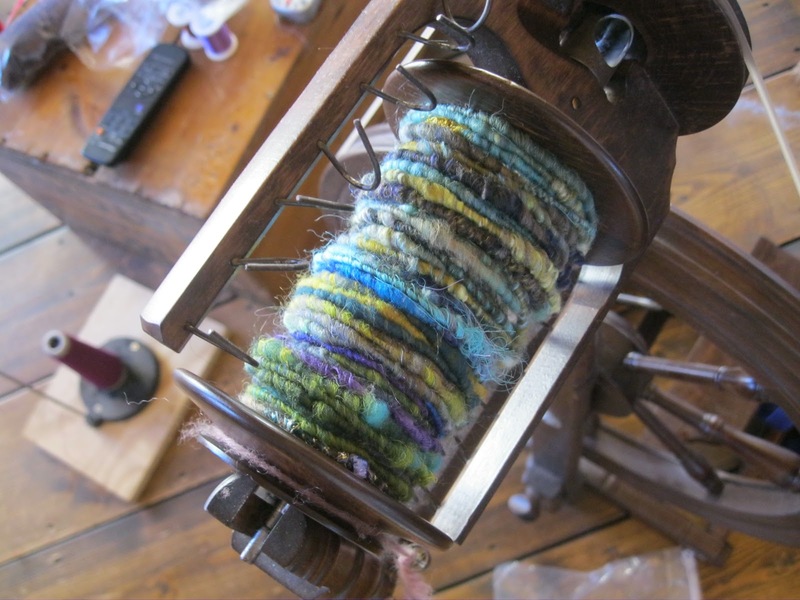 Monte and I worked together in the yarn shop all the years we were open, and for a year or more afterward, and her offer to do this makes me feel like we're collaborating (creatively speaking) again, and it gives me a renewed joy in my own spinning. 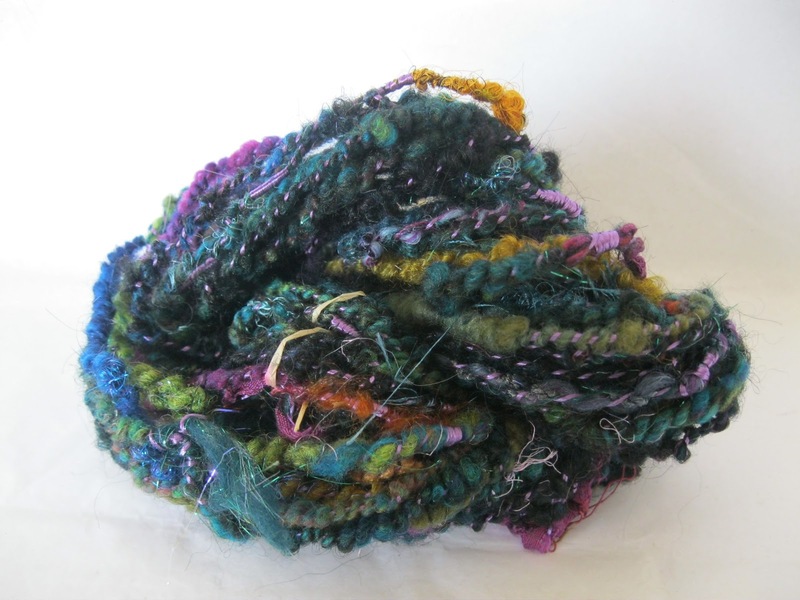 Her shop specializes in bundles of commercial novelty yarns and small quantities of specialty hand spun yarns which are probably primarily purchased by those who felt, make jewelry, or other surface design concepts. What's cool about this is that I don't have to worry about making skeins long enough for a knitting project (such as a scarf or hat), so I can really sink my teeth into making each and every one of these little skeins as full of life as I can without having to die of tedium trying to keep it going for well over 100 yards. It's like making a bunch of small paintings instead of one big one (not that I'm a painter, mind you). Oh...and the small skeins end up taking up as much time, if not more, than the longer skeins because I get so fussy and involved. It's OK...I do it for the love of it. As most crafts people and artists well know, it is a rare occasion when you really make an honest hourly wage for your work. And now, I'm off to drag my 25 year old serger out and see about getting some hooked rugs finished before I depart...I'm on a roll! Gosh time flies. Its hard to believe its time for you to relocate again. Having just started an Etsy shop, I can relate to your feeling about niche. I've become more calm about the type of yarn I like to spin. I tried out spinning an art yarn...with challenged results! LOL I know now that I make the type of yarn I like to knit. It's about being true to you, don't you think? Your yarn is stunning!! I can see why you love doing the "artsy" yarn!! It is fabulous! You should be dang proud of yourself for tackling all the projects you had to do!! Now relax into some hooking!!! BTW...... where DOES all the time go? It flies by so quickly even when we're NOT having fun!! Your yarn is fabulous! I have a mission to branch out and learn new spinning techniques. I hope you enjoy your time in California!